Find out why James Hardie is the right choice. Learn about the great results other builders and contractors have had by using James Hardie products. Until now, no company has ever produced siding that blends the architectural details of an earlier time with the durability required by modern living. 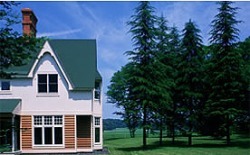 NuCedar Mills makes no compromise with its Classic Clapboard® line of siding, coordinating trim and accessories. Available in 22 standard colors as well as any custom color imaginable and backed by an industry-leading warranty, you’ll see why NuCedar is the leading choice for the discerning homeowner! For all your building needs, CertainTeed offers a complete line of Vinyl and Fiber Cement Siding, Trim, Roofing, Windows, Insulation, Fence, Railing, Deck, Walls, Ceilings, Pipe and Foundation products.